We have problems with SignalR solution hosted on Sharepoint. Everything was working fine on dev environment, where there is one machine, problems started when we decided to use SQL scaleout to deal with multiple frontends. Unfortunately it seems like SQL server is ignored - no tables are created, there are also no entries in logging file concerning sql bus. How to figure out what's going on? I'd like to know whether the application throw any exceptions/errors on prod environment. Besides, please check whether the database user (that you use to access the database) has permissions to log in, create schemas, and create tables. 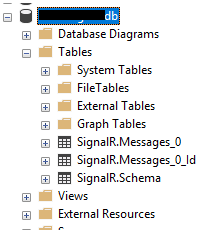 When running a sample SignalR project (https://docs.microsoft.com/en-us/aspnet/signalr/overview/getting-started/tutorial-getting-started-with-signalr ) with SQL scaleout everything works fine. The scaleout in our app doesn't work anywhere, on any environment. The user has access, we're using trusted connection for a domain user on db. The user is dbo on the db. We'd tested the user with management studio. There are no exceptions\errors regarding SQL scaleout. Depending on configuration in OwinStartup there either were no errors, or some, in console when running page, regarding SignalR startup. But whatever the options set, SQL scaleout never worked. I did a test to implement [scale out with SQL Server](https://docs.microsoft.com/en-us/aspnet/signalr/overview/performance/scaleout-with-sql-server#configure-the-database), and the backplane can help create the necessary tables for me. The user has access, we're using trusted connection for a domain user on db. The user is dbo on the db. If possible, please share the detailed sqlConnectionString you are using in Startup.cs (and please hide your User ID and Password etc information), so that we will help check if something wrong with it.